The idea of writing a whole book can feel overwhelming. But tackling the project a little bit at a time – such as writing stand-alone scenes – keeps you in the groove, the flow. Scenes can be written in short spurts of time, like after putting the kids to bed or before going to work. And stand-alone scenes are a great place to practice things like dialogue, character development and creating a story arc; skills that will help you write that full manuscript. For guidance on writing a scene and more tips on staying in the flow, go to the New Spirit Journal website for my full article — Musings of Memoir: How to Stay in the Flow. Wishing you a day of focus, discipline and satisfaction by staying in the flow….. Please celebrate with me! My new column, Musings of Memoir, has just launched with New Spirit Journal. Below is the lead, followed with a link for the entire article. I hope you find something helpful, hopeful or handy! People write memoirs for all sorts of reasons and at all stages of life. Some people know exactly what story they’ll tell, while others aren’t sure where to begin or feel they have nothing worth writing about. A friend once told me that she could never be a writer because her life had been so uneventful; yet, in the same conversation, and with tear-filled eyes, talked of a child she was sponsoring in Mexico. My eyes welled up. I wanted to know more about the little girl living in poverty in this far-away place. My friend was sharing about a meaningful experience but hadn’t considered it as part of “her” story. When I suggested she write about the girl, she said she wouldn’t know the first thing about how to start. Regardless of where you discover a story, one of the biggest challenges for telling it is figuring out how to begin. For tips, ideas and inspiration on how to get started writing your story, see the full article on the New Spirit Journal website. In anticipation of my new column, Musings of Memoir, with New Spirit Journal, I wanted to share an interview I did with Krysta Gibson, publisher of NSJ, on her Keeping it Real show, where we talked about the writer’s life. Musings of Memoir is place to share ideas, tips and inspiration for anyone wanting to write a memoir or personal essay. For now, check out Krysta and me talking it up! At the beginning of every year, I settle on a word—a theme—to carry me through the next 365 days. 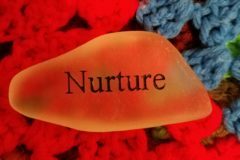 This year, I’ve chosen the word NURTURE. I am sharing my word with you in case you find it helpful or perhaps to inspire you to have your own word of the year. And because I love wordplay, I whipped up a mnemonic device (an acronym of sorts) for NURTURE that supports my specific way of being. You can take this word, or any other word, and make your own mnemonic or acronym—it’s fun. Plus, I find it helpful to have some sort of outline/structure to come back to when I veer of course. I’m using NURTURE as a guide to help meet some goals. Need. Clarify needs versus wants. Focus on the need (it supports the want). Choose one small aspect of the need and take action on it. Example: My current NEED is to get organized. The piles of papers, files, books and bills feel overwhelming and block my productivity. One small action to getting organized is having a place for everything so when I am done using the thing (such as a pen, notepad, book, stapler or file folder) I can put it away. If the item in the pile doesn’t have a home, create one or throw the thing away. Understand. Seek to understand how the NEED and WANT are related. Oftentimes the need supports the want. Understanding how the need supports the want is motivating and keeps your eye on the prize. I WANT to get my manuscript’s revision done so I can submit my proposal to the agents and editors who requested material in September at the PNWA Writing conference. I WANT to complete my essay (On Being Racist) and submit it for publication. This piece is important and timely. I WANT to create an inventory of articles for my monthly column, Musings of Memoir, that kicks off this month with New Spirit Journal. First article is nearly done, and due this week, but I want to get ahead of things and have several completed articles in the queue and ready to go! Once I get my desk cleared off (a need) I can think straight and work more efficiently (a want) to meet my commitments. Resources. Bring together resources to meet the need (to be more organized). Example: I am scheduling a weekly Executive Meeting with myself where I will track projects and and set priorities. Each Monday morning is reserved for this activity. These meetings will help me stay organized (a need). My resources are my Outlook calendar, Bullet Journal and timer. Drawing on resources can also mean using your inner wisdom or experience, reaching out to a trusted friend, or using prayer and meditation to tap into your higher spiritual insight. I often find answers and additional resources when I still my mind. Teach. Teaching and learning are a central part to my way of being. The more I teach, the more I learn. The more I learn, the better I teach. Consider how actions are, or can be, related to teaching. This is an efficient use of time. Example: I’ve been on the receiving end of edits for my personal essays and memoir writing for over a decade. In my twenty-plus year engineering career I checked and edited the work of others. I am now integrating my skills and understanding to teach others how to write their story. Universal. Be sure the work has a Universal appeal. Example: As a writer, in order to connect with readers, my writing must be done in a way that has a common, or Universal, theme with others. I didn’t always know this, but a main reason I write and teach is to build community with others. In my memoir, I share about how I grew up isolated and ignorant and how my ignorance created limitations and obstacles as I got out into the world. A major discovery was learning that ignorance and stupidity are not the same thing. In my coming-of-age story, I show how this insight (that I’m not stupid, just ignorant) allowed me to be in the world with more ease and opened my mind to learning. Being ignorant is a Universal condition—no one knows everything. But, importantly, no one likes to have their ignorance exposed, which happens in my story. Readers will have empathy and be able to relate to this Universal feeling of shame and humiliation. Recognize. Notice what’s working and what’s not and take immediate action to correct whatever is interfering with attaining NEEDS and WANTS. Track daily actions to see patterns in behavior, people or environment to pinpoint problem areas. Example: Over the past few months, I used an Excel Sheet to track various aspects of my daily habits and symptoms based on actions. I noticed that I need to exercise in the morning hours, eat between certain hours, and go to bed by 10:00pm in order to get a restful night’s sleep. I sort of knew these things about myself but I wasn’t doing them consistently. Tracking my behavior for just a few weeks helped me reset my schedule with my husband (who has a total opposite exercise, eating and sleeping schedule than me) and get back on course. Nurturing my needs & wants include recognizing when I am feeling out of sorts then track habits for a few days or more, pinpoint the problem and correct it before it becomes a (bad) habit. Sometimes the problem is who you are spending your time with, not your actions. Pay attention to how you feel after being around certain people and limit your time with those who leave you feeling depleted. It’s surprising how many energies we allow in our lives that do not align with our own vibrations. One or two is okay, but it’s important to set boundaries and limit people who do not emit an equal-to-or-higher energetic vibration (especially if you are a highly sensitive person (HSP) because you tend to absorb their toxic energy). Enjoy. Choose a small thing that brings pleasure and savor it—enjoy every teeny tiny aspect of the thing. Science proves that your nervous system can be trained to feel happier when you focus on the many little happy moments over and over. (Google the word neuroplasticity). Example: I feel so happy about writing this post and having some sort of structure to guide me this year. I have so many important “wants” to complete and getting (staying) organized is the number one action I can take in meeting my needs and satisfying my wants. I am going to tap into this feel-good energy and soak up the goodness into my body, creating even more space to nurture myself. Although the word NURTURE has a softer feel to it, I am taking a harder and more practical approach here because being organized feeds my (Virgo) way of being; it feels good, nurturing. In addition to the above practical aspects, though, a little retreat, massage or playing hooky to go skiing is in the plan too! What one word, thing or theme can you carry with you this year? Whatever you choose, I wish you a beautiful and bright year ahead. May you feel nurtured in every way. . .